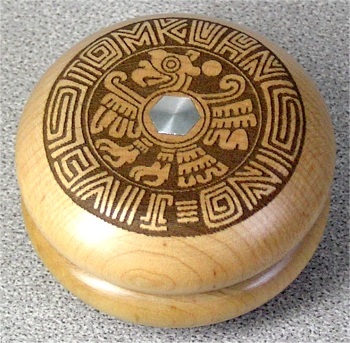 The Quatle Mandalas and Roller Woodys were made specially by Tom Kuhn Yo-Yos, and feature a very beautiful and intricate laser carved design created by Scarecrow, Matt Carter. I'm proud to say these were a custom design and special order designed by myself and Matt, and sold only thru Dave's Skill Toys online store. Made with the special permission of Tom Kuhn. After Scarecrow's popular Celtic designs, we decided to make mandalas featuring other cultures around the world. Matt became interested in Mayan and Aztec art, and that led to the Quatles. Quatle is short for "Quetzalcoatl", the feathered serpent god of the Aztecs. We kept mispelling the name in emails, so we shortened it to "Quatle", and the name stuck. Only 100 of these were made in the standard configuration. There was a variation in this model. About half of the Quatles were lightly lasered, and about half were heavily lasered. The lighter versions were most popular, but many were fond of the more antiqued look of the heavy burns.